Over the years, I can’t adequately express how many different types of “study guides” I have created and abandoned in preparation for art history exams. Everything from bullet-point lists of artworks to Word documents outlining terms and big-picture questions to Powerpoint slides with all required artworks and identifications. If you name it, I’ve probably tried it. The problem with all of these study guides is that while they accurately convey what to expect on the exam in terms of content, they aren’t interactive. They seem to work best for students who are already good at taking notes but need some reminders about the important material. Like many of us, I came to the early realization that students do not necessarily show up to my classroom knowing how to take good notes. Taking effective notes is a learned skill, not an innate ability. I wanted a study guide that students could interact with from the beginning of a lesson to the end, rather than a document that they consulted immediately before the test. The study guide also needed to model good note-taking and organization for college freshman, many of whom fill the seats of my art history survey. To do this, it meant that I had to make several big changes in my preparation: I had to loosen up my electronics policy, I had to decide and commit to a series of works before class, and I had to reliably have the study guide (with visuals) ready before students walked in through the door. The one thing that I emphatically did not want to do was circulate my lecture slides. They are simply too large of files and too unwieldy for a student to make good use of them. So I began exploring alternatives. 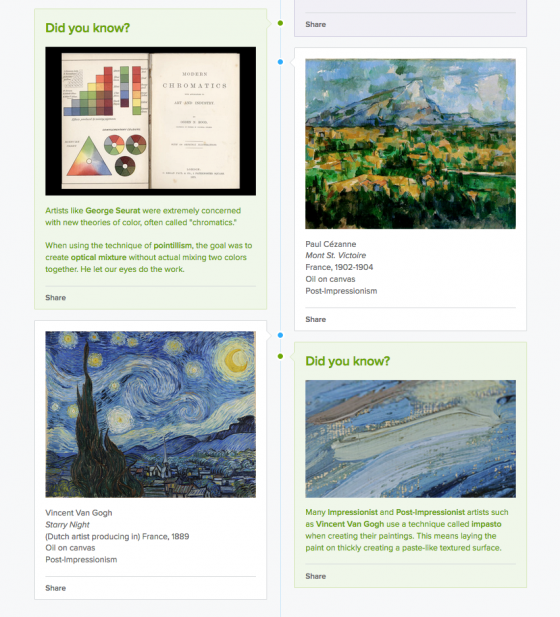 For two semesters, I have been experimenting with an online tool called Sutori for my art history survey courses. The program (formerly called HSTRY and rebranded as Sutori in 2016) is intended to tell stories in an interactive way. Their website used to read, “Stories amaze, stories teach. Stories connect, stories touch. Sutori is the perfect place to share any story.” Couldn’t we all say the same thing about art? I have always likened art history to storytelling, so I gave it a try. I originally started using Sutori for project-based assignments, like collaborative timelines and class dictionaries, but I have found that they can most effectively be used to create effective interactive study guides for students to use in and out of class. Sutori allows the user to create a “story” with different modular units that are organized on a bare vertical line. There are free, paid, and institutional features available. This write-up is based on having access to a paid or institutional account, but you can still feasibly create a study guide with the features available in the free version. 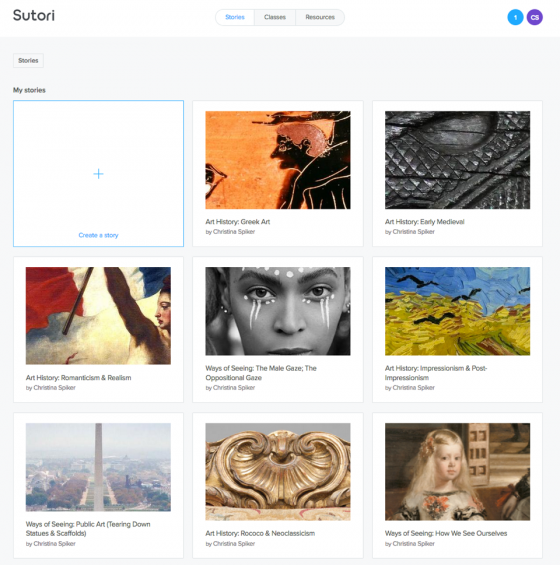 With a free account, you can create a site using text blocks and images, while a paid account opens up further text customization, headings, video, audio, multiple choice/matching quiz questions, and recently, a new embed feature that can link to Google Drive, Prezi, Instagram, etc. My study guides use a combination of all of these tools, but I usually begin with a set of big-picture questions, a list of terms, a map, and occasionally a timeline. I flesh out the rest of the site with artworks, quiz questions akin to those of Khan Academy, and videos demonstrating various artistic processes. In a nutshell, I try to create a streamlined version of my lesson plan. Here is a sample of a study guide from art history and one from visual culture. The usefulness of these study guides depends on one extremely important feature of Sutori: the ability to make a copy of any existing page and edit it with your own information. I encourage students to copy the study guide that I create to their own account and take notes on it during class. Ideally, if a student chooses to participate and does so fully, they complete a useful reference tool for future study by the end of the unit. I have found that without my prompting, many of my students copy it and then share it with 2 or 3 other members of the class to edit it collaboratively. This past semester, I tried something new. While students used the study guides that I created for everything before the midterm, I assigned groups of students to create the study guides to share with the class for the remaining material. Since they were already familiar with the format, they went into the project with clear expectations. It empowered them to make decisions for the class with regard to the direction of content while giving them the motivation to do thorough background research in order to present it to a wider audience. And by taking charge of various lessons, each group could responsibly answer each other’s questions directly on Sutori through the comment feature. I collected comments from my students in four classes across two semesters (3 surveys, 1 elective), and the feedback has been promising thus far. This semester, when I asked what we should “stop, start, and continue,” more than half the class said that we should continue using Sutori for study guides. Most responses appreciated having the study guide available before the lesson. Many students commented on how using Sutori helped them take better, more comprehensive and structured notes. Others suggested that it helped them to quickly see gaps in their knowledge. Some students reported enjoying the collaborative nature of the project, and spoke of “positive pressure” to do well because “the whole class is relying on my group for that information.” There was also more neutral and negative feedback involving other note-taking preferences (such as traditional pen/paper or OneNote), and more general complaints about group work. In sum, Sutori has become a useful item in my pedagogical toolbox. Creating study guides through this platform not only helped better prepare my students for exams, but it has taught them the value of well structured note-taking and collaborative study at the survey level. This looks like a great resource! Are you willing to share your study guides with the public? I am currently in a teacher credential program and searching for great ideas to help my future students. Hi Melissa — Thanks for your comment. Right now the study guides are pretty specific to my classes (they have reminders of deadlines and are limited to content covered in my classes), but I would be happy to share a couple as samples with you so that you can see the possibilities. Let’s talk about it! The best way to reach me is via e-mail (cmspiker [at] stkate [dot] edu) or through the form on my website http://www.cmspiker.com which goes to the same inbox. I think Sutori would work really well for students at all levels so we can explore some ideas on how to adapt it for your future students? Christina, this sounds wonderful! I’m going to check into Sutori right away! One question, what happens to those students who do not have access to technology?